Like that space between the couch and the wall, Netflix is full of amazing finds. Finds that are pretty much ruined if the buffering time takes even longer than the Star Wars: Phantom Menace trailer you tried to watch in the days of dial-up. Thanks to Reddit, the insufferable waiting games are over. Here’s a hack to access the hidden streaming features on Netflix, so you can adjust your buffering settings and get back to your binge session. A weird grey pop-up will appear on screen. 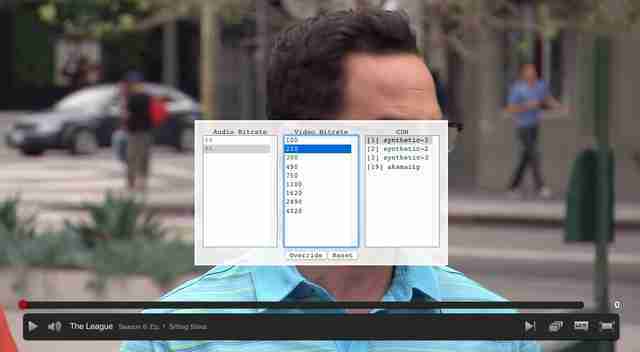 Once there, select a lower number from the center column marked Video Bitrate and hit Override. Opting for a lower bitrate will reduce the streaming quality of the video, but it will put an end to the choppy starting and stopping since it requires less bandwidth, meaning you'll actually be able to watch said video before the next Ice Age hits, or before else moves on to the next cool show. You guys seen Narcos yet? Joe Oliveto is a former writer for Thrillist. And yes, he's catching up on Louie. Follow him on Twitter.